At Southpointe Dental in Red Deer, we strive to provide a comfortable and relaxing environment to complement your dental care. Welcome to Southpointe Dental, your Red Deer dentist office. 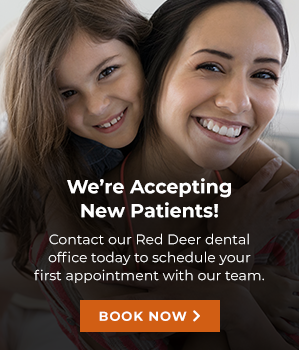 We are your full-service dentist office in Red Deer, providing a safe, comfortable and accessible location for your family’s general dental needs. Whether it’s time for a routine checkup, a root canal procedure or any of our other services, our mission is to provide reliable, quality dental service to all of our patients while treating you like family. From children to seniors, we serve patients of all ages and walks of life. As your dentists in Red Deer, our office offers a variety of general dentistry and cosmetic services, services for kids, and even sedation options for nervous or anxious patients. Our friendly staff is ready to help you, whether you have a question about your oral health, cosmetic treatments, or billing.